Some documents relating to the rebellion were found by the local ethnographer Boris Sennikov in 1982 while he was engaged in clearing sand from the altar of the Winter Church of the Kazan monastery. During the 1920s, the monastery had been requisitioned for use as the local Cheka headquarters and the church had served as the archive of the Tambov Military Commissariat. Some scenes of the rebellion are depicted in 2011 movie Once Upon a Time There Lived a Simple Woman by Andrei Smirnov. Apricot Jam and Other Stories (2010) by Aleksandr Solzhenitsyn. In a short story about Marshal Georgy Zhukov's futile attempts at writing his memoirs, the retired Marshal reminisces about being a young officer fighting against the Union of Working Peasants. He recalls Mikhail Tukhachevsky's arrival to take command of the campaign and his first address to his men. He announced that total war and scorched earth tactics are to be used against civilians who assist or even sympathize with the Union. 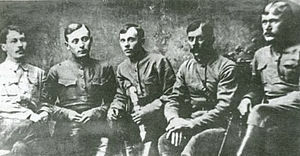 Zhukov recalls how Tukhachevsky's tactics were adopted and succeeded in breaking the uprising. In the process, however, they virtually depopulated the surrounding countryside. ^ a b Robert Conquest, The Harvest of Sorrow: Soviet Collectivization and the Terror-Famine, Oxford University Press, New York, 1986, ISBN 0-19-504054-6. ^ a b c d e f g Nicolas Werth, Karel Bartošek, Jean-Louis Panné, Jean-Louis Margolin, Andrzej Paczkowski, Stéphane Courtois, The Black Book of Communism: Crimes, Terror, Repression, Harvard University Press, 1999, hardcover, 858 pages, ISBN 0-674-07608-7. ^ Lenin to Kornev, 19 October, 1920. Accessed 21 June 2017. Brovkin, Vladimir N. Behind the front lines of the civil war: political parties and social movements in Russia, 1918-1922 (Princeton University Press, 2015). Hartgrove, J. Dane. 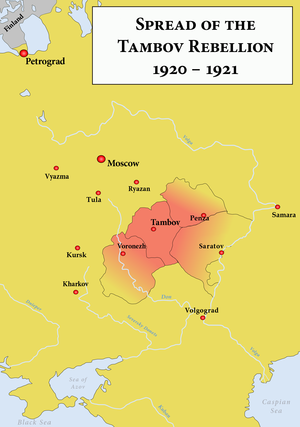 "The Unknown Civil War in Soviet Russia: A Study of the Green Movement in the Tambov Region 1920-1921." (1981): 432-433. Landis, Erik‐C. "Between village and Kremlin: Confronting state food procurement in civil war Tambov, 1919–20." Russian Review 63.1 (2004): 70-88. Landis, Erik C. Bandits and Partisans: The Antonov Movement in the Russian Civil War. — University of Pittsburgh Press, 2008. — 381 p. — (Series in Russian and East European studies). — ISBN 9780822971177. — ISBN 0822971178.